"Ruby Sparks" does the unthinkable - it proves that there is still hope in the romance-comedy genre by providing something fresh and thought-provoking in the process. Plus, it's one that even men can relate too. Yup, that's right - men can relate to this. In fact, it is a cautionary tale of a man's voyage to find his and maintain his perfect girl. But beyond that, it is also one funny film. It's amazing to see one film contain so many issues and topics and yet come out light and easy. "Ruby Sparks" may delve into the realm of fantasy but what it starts out with fiction, it works with what is reality for most couples. And that makes a striking chord for most of us. Calvin Weir-Fields (Paul Dano) is a young writer struggling with writer's block. it does not help that he already wrote an award-winning novel when he was 19. A decade after that, he still is having a hard time coping with his genius status and to create a novel of equal quality. When his therapist advises him to write a story about his dog Scottie, Calvin instead dreams and writes about his dream girl Ruby Sparks (Zoe Kazan). He realizes that the further he writes about Ruby, the more he is falling in love with her. Calvin realizes that this is crazy as Ruby is the work of his mind and won't be real ever. But one day, Calvin wakes up to find a girl cooking breakfast and she is Ruby in person. 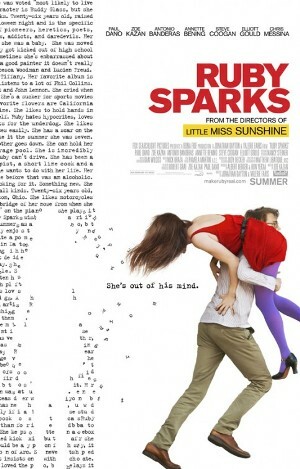 "Ruby Sparks" is the perfect mix of great acting and creative material that produces one thought-provoking film. It indeed helps that the quirky Paul Dano was into his character deeply. You could actually feel who Calvin is - a young man bitter with his former love, struggling with his genius and one who has yet find what love is. This quirkiness also brings a lot of laughter when it's needed. Our favorite is when Calvin discovers Ruby is real and Calvin thinks he is crazy. While the film may feel light, in fact it is not. It is a film that at first tackles the fantasy of one's fiction turning real but the film also delves and transforms that fantasy into a realistic look into relationships and love. In particular, as the honeymoon phase of Calvin and Ruby ends, Calvin is in a fork if he should control Ruby or not. As Ruby wants to be free, Calvin seeks more control and changes Ruby to his liking. It sounds sick on paper and it feels sicker and darker when you do watch it. You see, "Ruby Sparks" is going to make you think of not only love but also life, of friendships and family, of time and priorities. - there's nothing much to say anything about "Ruby Sparks"